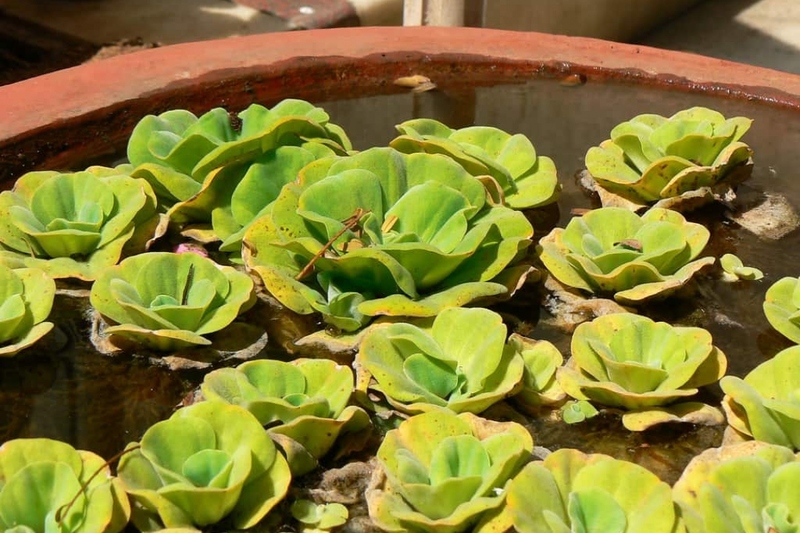 Water Lettuce (Pistia stratiotes): growing, planting, caring. An aquatic plant in the arum family. Pistia is a genus of aquatic plant in the arum family, Araceae, its single species being Pistia stratiotes - water cabbage or water lettuce - present, either naturally or through human introduction, in nearly all tropical and subtropical fresh waterways and considered an invasive species. Every month, tear off some of the water lettuces, otherwise they may dominate your other plantations. It's the easiest plantation you can imagine. If you have a pond with no limestone water, just put a plant on the top, and voila! Remember to take one or two plants and keep them in an indoor aquarium as soon as temperatures fall below 15 ° C.
The warm days come back? From May, you can put back your water lettuces on the pond that where sheltered inside.